See the technical specifics and details involved with urethane belting. 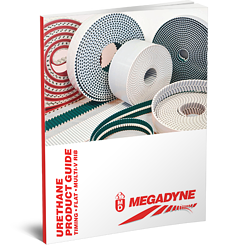 In our Urethane Product Guide, you can get insight on everything from urethane belt basics to specification comparisons. Fill out the form on the right to access the Urethane Product Guide. This brochure presents our urethane timing, flat and multi-vee belt portfolio. From a broad range of material options and manufacturing processes located in all three regions of the world, Megadyne is well positioned to meet your synchronous and non-synchronous belt requirements. Additionally, our state-of-the-art fabrication facilities can work hand in hand as your partner in design to deliver tomorrow's solutions today!